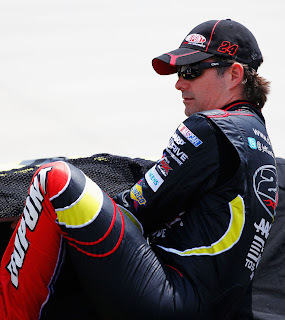 You wouldn't have known it when you look on paper at the FedEx 400 at Dover, in which Jimmie Johnson led 289 laps and won easily, but it was his teammate Jeff Gordon that had the finest car today. Gordon started the day in 14th and he chased down Johnson for many laps, finally taking the lead on lap 211. Gordon would lead thrice for 60 laps and was setting sail on Johnson, leading with 89 laps to go by five seconds. But on lap 324, Gordon chose to pit, hoping that his strategy to short-pit would allow him to cycle into the lead if there was no caution. But the caution flew on lap 340 for debris in turns 1 and 2, trapping Gordon a lap down. He was able to get his lap back but he was too far back to make much of a charge, finishing in 13th place. It's been one of those seasons for Gordon, who right now sits in 21st place in the point standings, and with no wins this season thus far after 13 races, he is 94 points outside of the Chase. With 13 races to go before the Chase for the Sprint Cup field is set, can Gordon get there? This has been Gordon's worst season of his illustrious career. He has been beset by bad luck all season long, whether it be his engine blowing in the Daytona 500, crashing at Bristol and Talladega, and at Martinsville, similar to today, having a dominant run ruined by bad luck as he was turned late by Ryan Newman while leading with only a few laps to go. And being so far back of one of the guaranteed positions for the Chase, his only hope would be to get in with one of the two provisionals given to drivers within the top 20 in the points with the most wins. The two provisionals right now are held by Brad Keselowski, with two victories, and the aforementioned Newman, whose only victory was the one at Martinsville. Only one other racer in the top 20 has a win and that is Gordon's teammate Kasey Kahne, who is only one point behind Newman. Gordon sits right now 55 points behind Newman and thus to feel comfortable, he will need at least two victories to get into the Chase field. That will not be an easy task to bag a couple of wins in the 13 remaining races before the field is locked, even as he has been in position for wins and runs for the best team in the sport. He's going to need some luck, which he has had none of this season. It certainly is possible but it will not be easy at all. And thus the chance of Gordon missing his first Chase since 2005 exists and it looms large over the number 24.